A delicious fried rice with crab ideal for any occasion – lunch, dinner, party or sunday brunch. Serve with a sauce or gravy of choice. 1. Heat the vegetable oil in a pan over medium flame. 2. Pour the eggs and swirl well. 3. Cook until the eggs are cooked evenly and remove from flame. 4. Allow it to cool and chop them into small pieces. 5. Heat olive oil in a pan over medium flame. 6. Add the garlic and fry for 10 seconds. 7. Add the rice and stir well. 8. Add the peas, crabmeat and 1 tblsp onions. 9. Mix well and cook for a minute. 11. Garnish with the fried shallots and lime wedges. 12. Serve with the chopped omelettes on top or by the side. 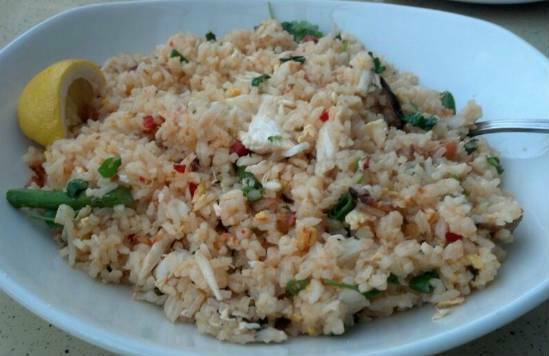 Feel free to comment or share your thoughts on this Crab Fried Rice Recipe from Awesome Cuisine.